One of my early childhood memories is of being sung songs before bedtime when I lived with my mother at my maternal grandparents home. Before I would go to bed my mother and her parents and siblings would sing songs with/to me. One of these songs was the children's song "The Ants Go Marching One by One." I really enjoyed this bedtime ritual, and would always ask for "one more time" of my favorite songs. What I didn't know then was that the song lyrics I remember so well was not the original lyrics. While watching the Ken Burns series "Civil War" the other night on Netflix, and I heard this song in the background and that made me look into it. 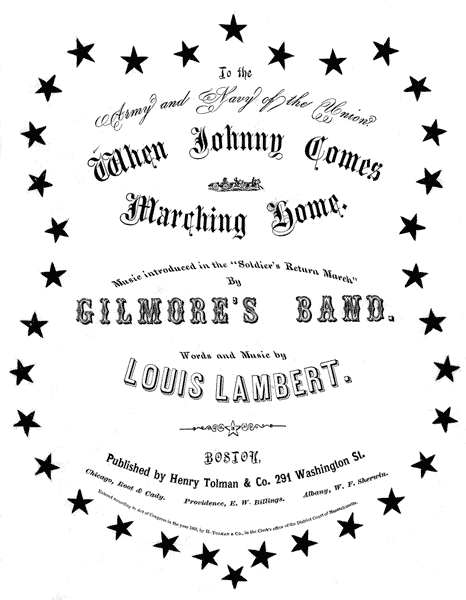 It turns out that the song was "When Johnny Comes Marching Home", written by Patrick Gilmore (under the pen name Louis Lambert) and dates to the Civil War. When Johnny comes marching home." Before the song was "When Johnny Comes Marching Home", the melody was a drinking song "Johnny Fill Up the Bowl"
Johnny fill up the bowl". Johnny fill up the bowl"